You are here: Home / Domestic Bliss / Christmas Traditions – No Elf on the Shelf for Us! Christmas Traditions – No Elf on the Shelf for Us! How can little kids look at that and not have nightmares? Every year, I see some awesome things done with the Elf on the Shelf. One of my favorites, actually, was the Elf on the Shelf appearing in some rather adult poses, like when he was passed out next to a pile of beer bottles. 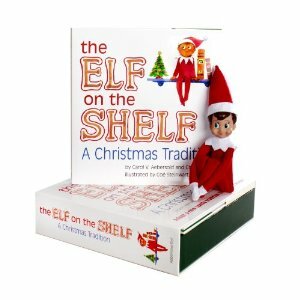 Some families gleefully embrace the Elf on the Shelf as part of their Christmas traditions. As a two year old, Norton is probably at the perfect age to start moving around the Elf on the Shelf. He’s young enough to just begin discovering the magic of Christmas. This is when developing our own Christmas traditions really make a difference. Theoretically, the Elf on the Shelf should grace our home. That being said, there will be no Elf in our house. There’s a very simple reason: that thing is creepy as all get out. I find it unnerving, and quite frankly, I wouldn’t be surprised if that evil looking little thing decided to start moving around on its own and pestering the puppies. Maybe I still have a very vivid imagination, but I swear I’ve seen movies where dolls that look enough like that little Elf has run around with gigantic butcher knives and such. Are there any toys that are too creepy to be in your house? What Christmas traditions does your family skip out on? LOL!! Funny post. . . I know lots of people who think the elf is creepy. We just never did the elf in my family! I really need to get one – my 1 & 4 year olds would love it! Frugal G33k recently posted…Michael Todd Organics Giveaway!! I heard about this for the first time last year. I am thinking about trying it this year with my boys. I think they’re pretty creepy, too. I just don’t understand the fun of them. Why would you want to have an elf do bad things around the house? I don’t think they’re always naughty, but those are the only ones that are amusing to me. Haha, I’m with you! We don’t do Elf on the Shelf either… creeper!!! Terin Garrett recently posted…Nimli Animal Print Scarf Giveaway! I never liked that elf. Good for you.